Meet Nora, the most beautiful little girl I've ever met. I'm so behind in blogging, this little nugget is almost a year and a half! We took these photos in my Northeast Mpls studio back in September during my first-ever Mini Session day to celebrate the big first birthday. Isn't she a DOLL?! 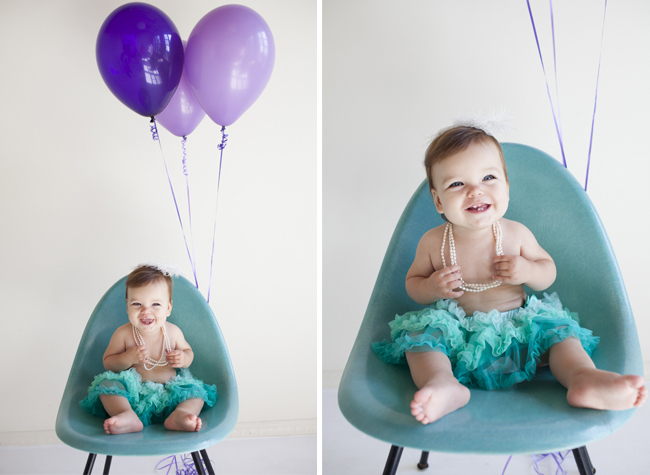 Her mom Megan picked out this teal tutu and headpiece, I brought the balloons and there we were :) Nora was all smiles and had a great time eating her very first cupcake! This session represents a huge moment for me: it's the day I fell in love with this blank slate space that sort of fell into my lap the week I took my business full time back in May. I'd shot a few times there before, but this session, with Nora's smiles and the simple color palette that popped so fabulously just really made my heart soar. I've been craving more "heart soaring" moments as we're chin-deep in below zero temps here in Minneapolis. My daily uniform consists of about 3 pairs of socks and gloves and a hat and a furnace-style North Face coat and yet, I'm still freezing. So! What warms us up more than LOVE? I decided to hold my THIRD mini session date - this one's all about the LOVE! - at my studio on Sunday, February 10th from 10 am to 4 pm. If you and your sweetie need some updated photos or want to show the world how much you love each other, call me! Or if your kids are looking especially cute these days and you'd love nothing more than a sweet iPhone background of their smiling faces, email me! Spots are limited (1 per hour, on the hour), so email me or comment here with your info to reserve a spot. Pricing is $225 this time around because my ultra-fabulous designer Rae is hand-crafting some loveable props and designs to showcase in your session, if you choose. And trust me, you will, because I can't get enough of these cuties and we're only in the beginning stages of creating them!